Remember, I need Vitamin C !!! "Sometimes I may need a bath. Warm water please!" "Careful not to cut too short!" "I like toys, they keep me busy"
Cavies (guinea pigs) originated in Peru in South America. Their taxonomic name is Cavia Porcellus and they are a member of the rodent family. Male cavies are called boars, and females are sows. Cavies are wonderful pets and are easier to care for than many conventional pets. They can be kept alone or in groups, and rarely will fight unless there are multiple boars in the presence of one or more sows. The average cavy will live to be 3-6 years old. Sows can be bred after the age of four months, and should be bred for the first time before 12 months of age if breeding is intended. Otherwise the pelvic bones can stiffen and cause problems with delivery. Sows have a heat cycle of 16-18 days. Average gestation for a pregnant sow is 62-74 days with an average of 68 days. The boar should be removed prior to birth so that the sow is not immediately rebred. It is advisable to allow the babies to wean (3-4 weeks) before rebreeding a sow, as to reduce her stress. The average litter size is 2-3, with litters of 4-6 not being uncommon. Babies are born fully furred with eyes open and are often running around and eating solid food within the first 24 hours. They should be allowed to nurse for a minimum of 3-4 weeks, after which time the baby boars should be removed as they are capable of breeding at 4 weeks. What should my cavy eat? Cavies, like people, need vitamin C in their diet. They should be fed fresh guinea pig pellets with vitamin C added. Vitamin C can also be added to their water bottle. Cavies also love fresh fruits and vegetables, such as dandelions, apples, oranges, strawberries, watermelon, lettuce, carrots and corn. For a complete list of acceptable fruits and veggies, visit the Guinea Lynx page. Cavies also need to eat hay every day to help with digestion and keep their always growing teeth trimmed. Timothy hay being good for all cavies and alfalfa suitable for young or nursing cavies. Where should my cavy live? Cavies should be housed in a well ventilated cage away from direct sunlight and drafts. Wire cages with solid bottoms are best. Cavy cages should be kept away from curious cats and dogs. There should be at least one square foot of space per cavy. What kind of bedding will my cavy need? Pine shavings or pellets, newspaper or newspaper pellets (Yesterday’s News), corncob bedding and hay are all suitable bedding for cavies. Kitty litter and sawdust are unsafe as the small particles can irritate their eyes, and Cedar shavings are unsuitable as they cause breathing problems for most cavies. What kind of toys will my cavy play with? 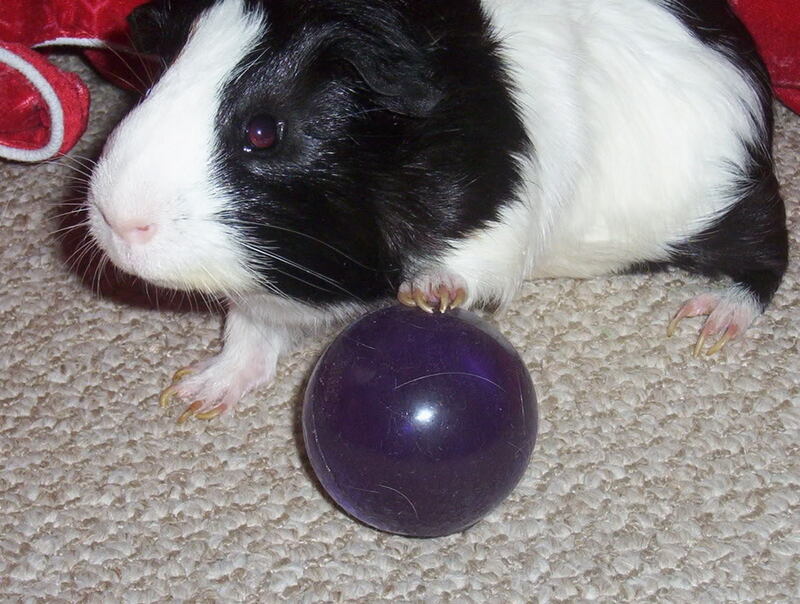 Young cavies are the most playful, but all cavies enjoy toys from time to time. Large tubes to crawl through or shoeboxes to hide in are favourites. Many cavies also like small plastic bird toys or cat toys with bells. They will also climb wooden ramps and will chew on wooden toys. This chewing helps wear down their teeth, which are always growing. A cavies nails will continuously grow and should be trimmed every few weeks with small nail clippers. Make sure only to cut the very tip or else the nail will bleed. Also, bath your cavy every so often if he/she is stinky in a small basin of warm water using mild baby shampoo or shampoo made for guinea pigs and rinse well. Thoroughly dry your pet before returning it into his/her cage.